10 CD + 2 DVD + 3LP (140-gram) + cassette + book + download code! 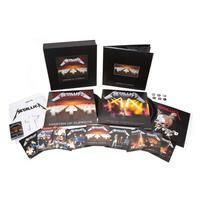 Limited edition box set contains 10CDs, 2DVDs, 3LPs, and a cassette tape. All this is housed in a hardcover book including never-before-seen photos, a folder containing handwritten lyrics, a set of six buttons and a "Damage, Inc." lithograph.